deSIGNery offers hundreds of different products and no two are ever the same. Companies order from us their custom vinyl stickers not only for the excellent quality of the material, but for the speedy turn around time and professional handling of every order. Our special cut stickers are printed the way you want it with the colors and shapes you need. Die cut vinyl stickers were created to give your stickers a one of a kind appearance and the ability to stand out over all the others. Check out our Spring Sale for savings on Custom Shape Decals & Labels and Custom Die-Cut Stickers in the following link. BBB Member since 2004 with a proven record of complaint free customer satisfaction on items like Custom Shape Decals & Labels. Click on the BBB logo above to check our record or leave a customer review. If you are in the market for Custom Die-Cut Stickers, give us a call today and you will soon realize why after 24 years we still have an A+ BBB rating! At deSIGNerySigns.com we have more than 24 years experience in designs for our Custom Die-Cut Stickers. Call us today and let our design specialists help create your next project to promote your product or business. 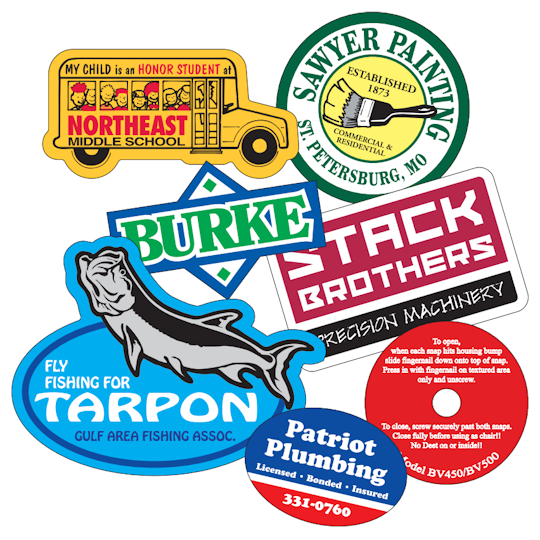 FREE Shipping on all decal and sticker products | Free layout | A+ BBB rating | 24 years in the business | Call Today for a free quote on Custom Die-Cut Stickers. Our decals are made from the highest quality of vinyl materials and clear polyester. They are custom made with your choice of colors, images and text to help your company stand out. These special shape stickers are screen printed, using UV inks to help prolong the life of your sticker. The UV inks aid the inks in fading slower so that you’re not stuck with a sticker that doesn't have anything left after 6 months in the sun. There are many options available for your specific needs. We offer temporary adhesive which is great when used for a temporary event. Just specify when you order, not additional charge for temporary adhesive. We also offer consecutive numbering. If you are using the custom die cut decals for parking passes, member numbers, machine equipment, you name it. This option is available for an additional cost. Clear polyester is a material used for stickers when you don’t want a full color to the edge and you just want your logo and text to stand out. Clear polyester is also used when face application is desired. To apply the decal to the inside of the window and to be read from the outside, clear polyester must be used and white is an additional color. Our custom die cut stickers look great indoors and outdoors and can withstand all outdoor conditions. Easy removal of the stickers save you time and energy with less clean up of sticky adhesive. Custom die cut vinyl stickers can be cut to any shape or frame you want. The cut outlines your logo or an image that gives your custom decal and fun new approach to advertising. If you just aren't sure how great our die cut decals are, feel free to request a free sample. Our samples come from overruns of previous jobs done so you can see exactly what it is we do. The free sample will be of a die cut decal so you can see how clean and precise the image is. We also offer free quotes. Send us your artwork and we will start helping you craft an amazing custom die cut vinyl sticker with every option you may need.